Above photo circa 1903. Kindly sent by Rory Kehoe. Above postcard circa 1948, kindly sent by Rory Kehoe. Above photo, 1952, also showing the "Anchor." Kindly sent by Rory Kehoe. Above photo taken in 1960 and kindly sent by Terry Wheeler of the Ramsgate Historical Society. 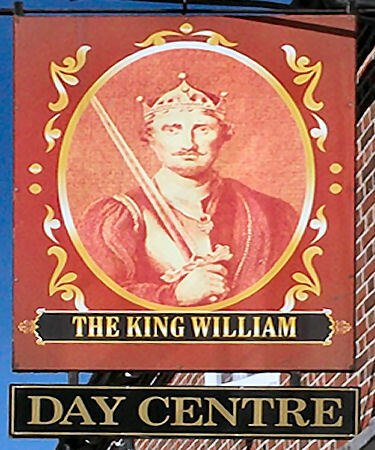 Above shows the King William before it closed, 2005. © Copyright Paul Hensman and licensed for reuse under this Creative Commons Licence. King William sign left July 1991, sign right June 1995. Picture taken off Google Maps September 2010. The predominantly 18th century King William IV public house is a Grade II listed building although part is a refronted timber-framed building. The car park for the public house lies between the property and Nos. 6-8 High Street. The wall at the back of the car park includes the remnants of three circular kilns of the oast house that once occupied this site. All are grade II listed. South Eastern Gazette, Tuesday 10 September 1861. From the Kentish Chronicle and General Advertiser, 14 September, 1861. Price 1 1/2d. 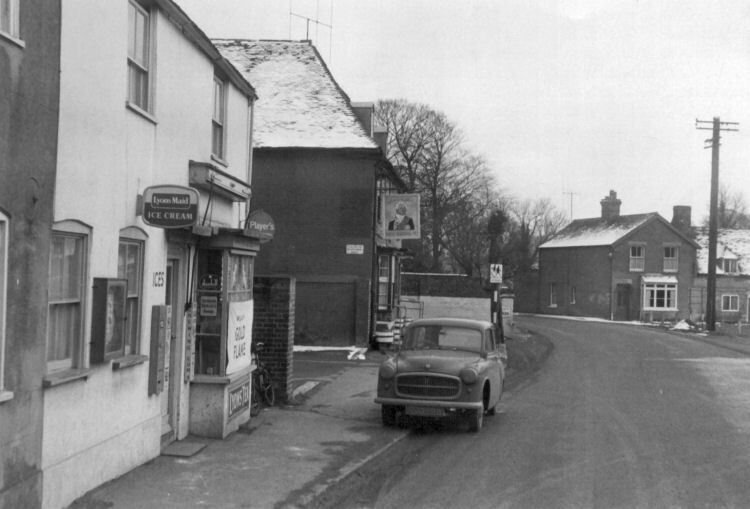 This was the annual licensing day for the public Houses in the division. All the old licenses were renewed, and the publicans were complimented by the bench on the orderly manner in which they had conducted their houses during the past year. 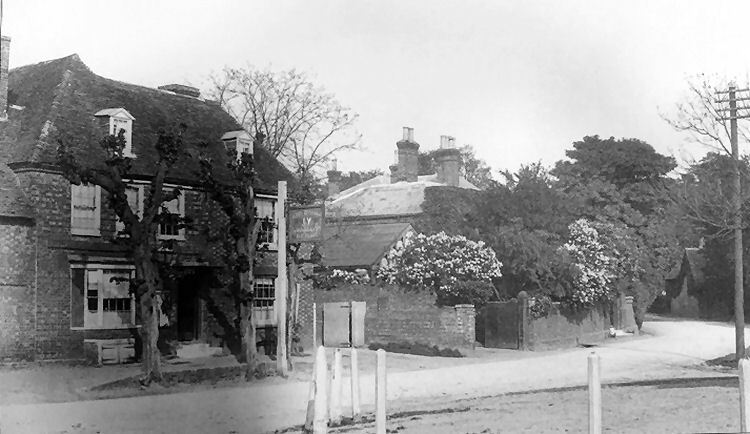 Applications for new licenses were made by Richard Jones, of the “Plough” beer-house, Ripple, and by William Cox, of the “King William IV,” Littlebourne. Mr. Delasaux supported Jones’s application, and stated that his clients house was the only one of the kind in the parish. He handed in a petition numerously signed by the parishioners. William Cox also handed in a petition, and after consideration the bench agreed to grant both applications. From the Dover Express and East Kent Intelligencer, 10 April, 1874. Price 1d. John Lane was charged with assaulting George Sutton, at Littlebourne, on the 3rd of March. 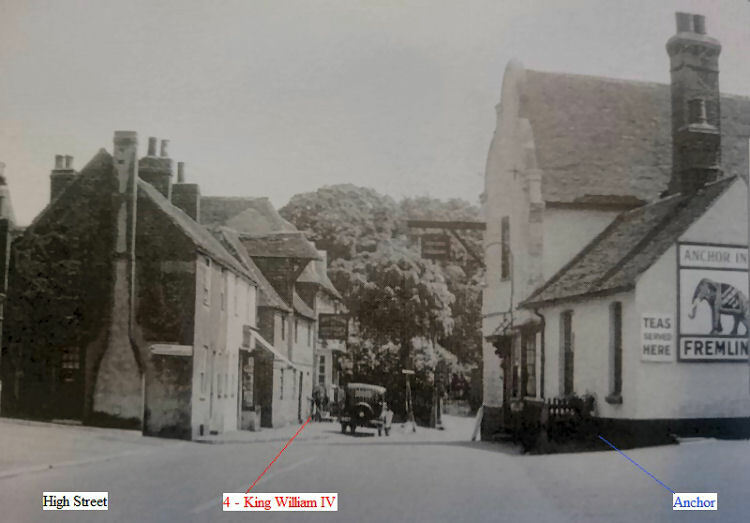 The prosecutor stated that on the day named he was in the "King William" public-house, which the defendant kept. The defendant called him outside the room he was in, when he knocked him down without saying a word. When he got up he struck him again and put him out of his house. He had his eyes discoloured by defendant striking him. The defendant also kicked him. William Stupple stated that he was a butcher to Mr. Kingsford, of Littlebourne. On the day mentioned he saw the defendant push complainant down the steps of the house and kicked him. He also saw him strike complainant. The defendant said he did not kick the complainant. The prosecutor was making a disturbance, and when he had some pots in his hands came and pushed him and struck him. All he did was in self-defence. Thomas Hogben corroborated the defendant's statement. The bench said they considered the case and not been clearly proved, and dismissed it. Parties catered for in large and small quantities. From the Dover Express and East Kent News, 6 October, 1916. Mrs. H. S. Andrews, of 21, Trevanion Street, Dover, was summoned for taking intoxicating liquor from the "King William IV," Littlebourne, after the regulation hours: and Mr. J. B. Brissenden, the landlord, was summoned for permitting the offence. It appeared from the evidence that a constable saw the defendant come from the "King William IV," and place a bag over a fence. He found that it contained ale and stout, and then Mrs. Andrews afterwards returned to the public-house, but later came to remove it. The evidence for the defence was that Mrs. Andrews, who was hop-picking, assisted in the evenings at the public-house, and bought the liquor at 7.30. She did not take it away till later and the landlord said that he did not know that. Mrs. Andrews was fined 5s. ; and the case against the landlord was dismissed. From the Dover Express and East Kent News, Friday, 7 January, 1921. The "King William IV," Littlebourne was granted an extension for January 25th in connection with a smoker of the comrades of the Great War. From the Dover Express and East Kent News, Friday, 6 June, 1924. Price 1½d. 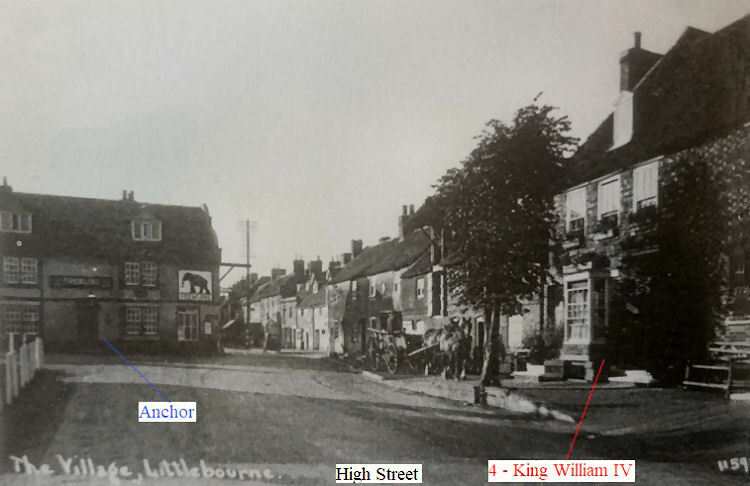 Herbert Henry Page of the "King William IV," Littlebourne, was granted an occasional licence to sell from 11 a.m. to 9 p.m. from a tent, on the occasion of the annual sports of the British legion at Littlebourne on Whit Monday. From the Dover Express and East Kent News, Friday 7 August, 1925. Price 1½d. The licence of the "King William IV," Littlebourne, was granted an extension from 10 to 11 p.m. on August 20th, for the annual dinner of the Royal Antediluvian Order of Buffaloes. From the Dover Express and East Kent News, Friday 3 June, 1927. Price 1½d. 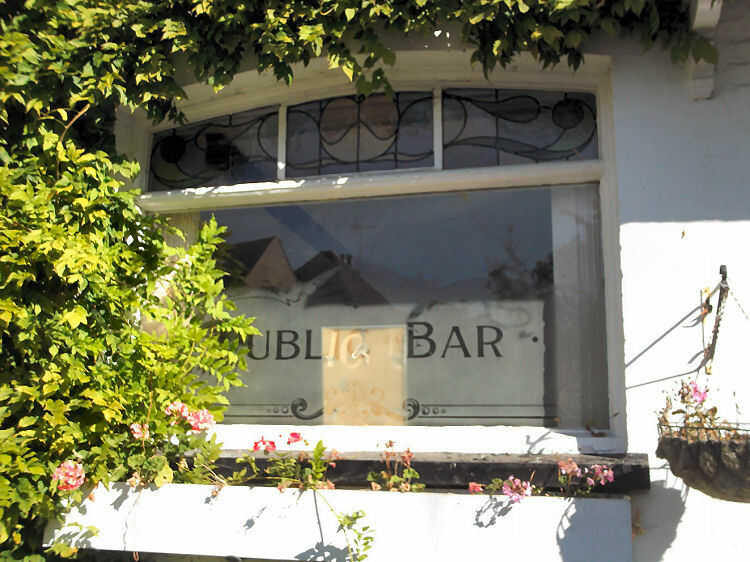 The licensee of the "King William IV," Littlebourne, was granted an occasional licence from noon to 10 p.m. for the annual British legion sports at Littlebouurne on Whit-Monday. From the Dover Express and East Kent News, Friday, 20 September, 1929. 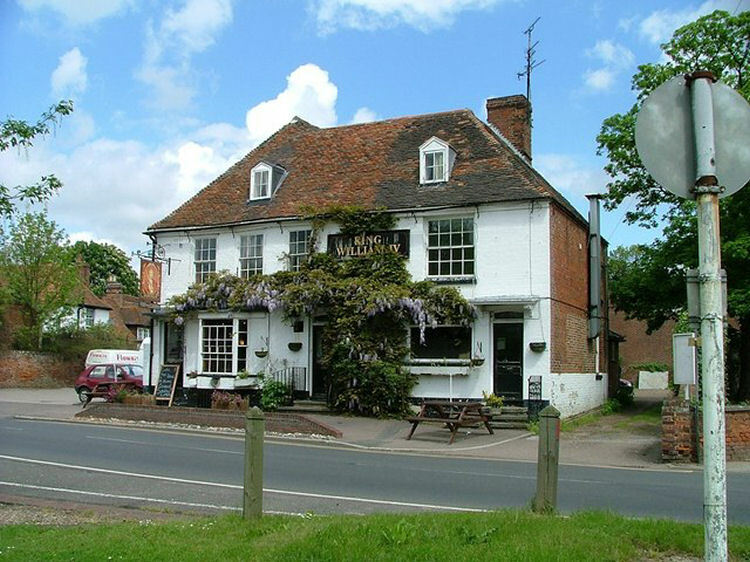 In regard to an application by the licensee of the "King William IV," Littlebourne, for two extensions for harvest suppers, Supt. Lane opposed as on the previous occasion there had been a large crown over from Ramsgate and they had made themselves a nuisance. The licensee said that it was the first time he had heard of it. From the Dover Express and East Kent News, Friday, 6 May, 1932. Price 1½d. 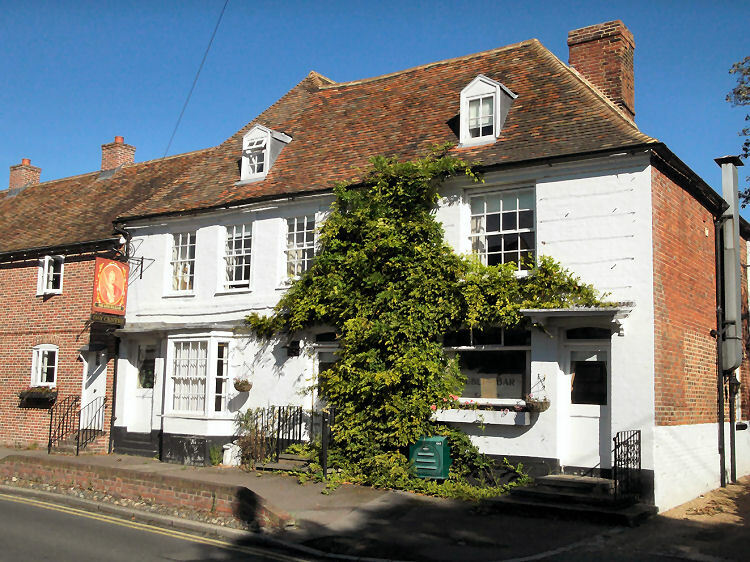 An occasional licence was granted to the licensee of the "king William IV," Littlebourne on May 14th, for the British Legion sports. From the Dover Express and East Kent News, Friday, 18 October, 1935. 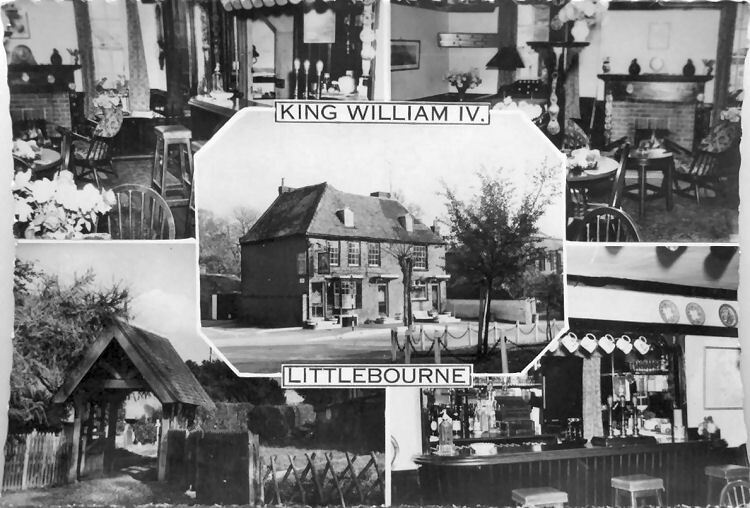 An extension was granted for the "King William IV," Littlebourne, from 10 to 10.30 p.m. on October 23rd for a dinner and concert of the Rat and Sparrow Club. From the Dover Express and East Kent News, Friday, 8 November, 1935. Price 1½d. The licence of the "King William IV," Littlebourne, was granted an extension until 10.30 p.m. on November 9th, for a British Legion dinner and concert, and an occasional licence fro Lee Priory on December 20th, from 10 p.m. till 3.30 a.m., for the annual dinner and ball of the Linen League of the Kent and Canterbury Hospital. From the Dover Express and East Kent News, Friday, 21 October, 1938. 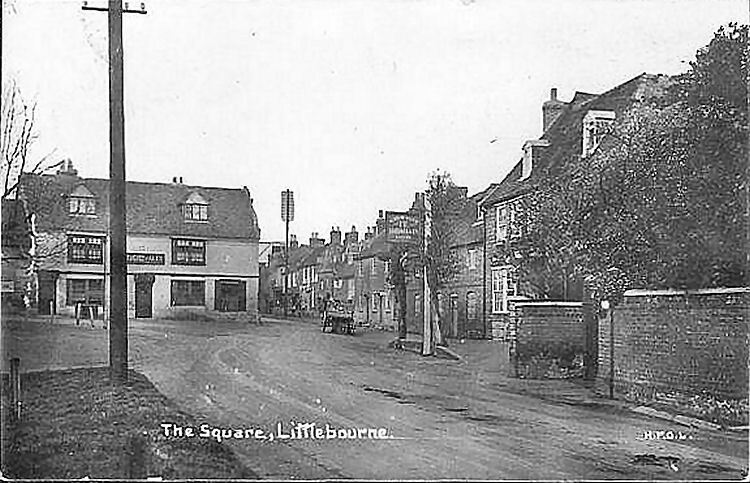 The licensee of the "King William IV," Littlebourne, was granted extensions until 10.30 p.m. on 22nd and 29th October, for harvest suppers, and on October 27th for the annual dinner and distribution of prizes of the Ickham and Wickhambreux Rat and Sparrow Club. From the Dover Express and East Kent News, 29 September 1939. The "King William IV," Littlebourne, was granted an occasional license for stock sales at Each Farm, Ash on 4th October and at Street Farm, Preston, on 18th October. 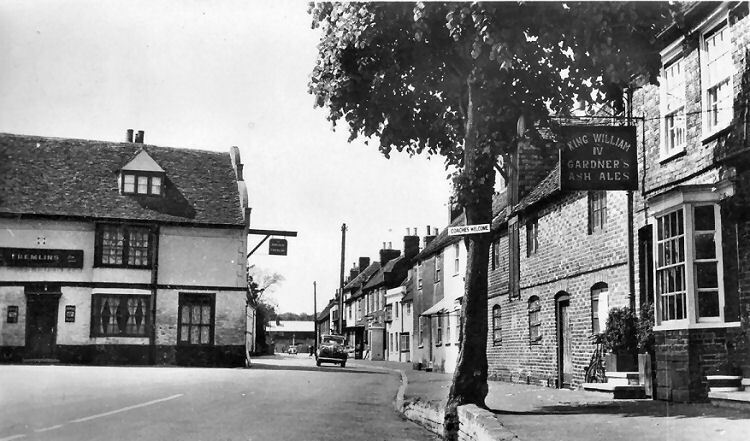 4th January 2001 the pub was flooded after the Nailbourne, the stream running through the village broke its banks. 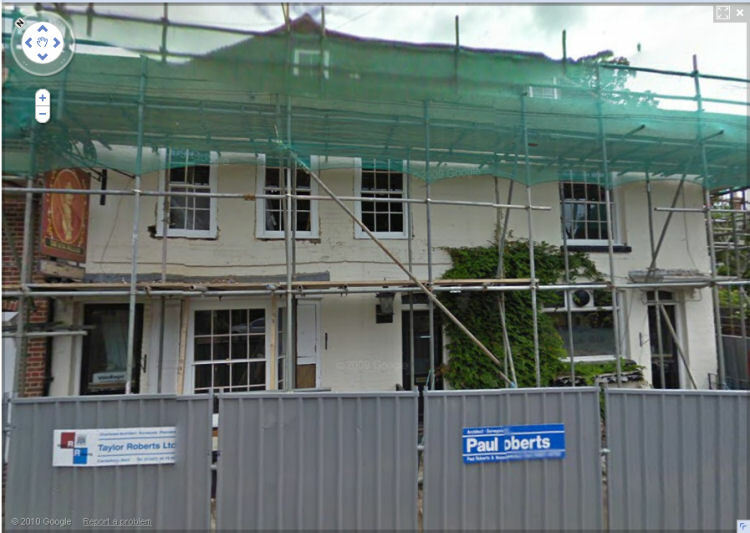 I believe this pub is now closed and being converted into houses. Sept 2010. Evidently it was converted into a Children's Day Centre. Above photo kindly sent by Peter Checksfield showing the building as of 5 October 2014. Above showing the window still advertising the public bar. Above sign by Peter Checksfield.